Which Text Editor is Right for Your WordPress Code? Next to reliable ol’ pen and paper, nothing beats a good, solid text editor when you’re using WordPress. Unfortunately, writing code is difficult with a pen and paper, and it doesn’t translate well to the internet. That’s when a basic text-editor program comes in handy. It’s a good idea to have one handy for writing Cascading Style Sheets (CSS) and HTML as well as coding WordPress templates and themes. Notepad is a basic text editor that you can use to write code without the fuss and worry of text formatting. Notepad doesn’t support any special document formatting or characters, which makes it great for writing code and web documents. Notepad is the go-to text editor for most Windows users because it’s a Microsoft product that’s packaged in every Windows operating system. Often, people use Notepad to view and edit text files with the .txt extension, but many people, including myself, use it to create basic CSS and HTML files, as well. Notepad opens, and you can start typing your code. Create your CSS or PHP document. Choose File→Save As, and then choose the location on your computer where you want to save the file. Type the filename, including the extension, in the File Name field. The name of this PHP file is header.php. However, if you’re saving a CSS document, the extension is .css, such as style.css. Choose All Files in the Save as Type drop-down list. By default, Notepad wants to save the file with the file type Text Documents (*.txt). Leave ANSI chosen in the Encoding field. This is default character encoding and is okay to leave as is. Notepad++ is a text editor for Windows and is often referred to as “Notepad on steroids” because the interface looks a lot like regular Notepad — but that’s where the similarities end. 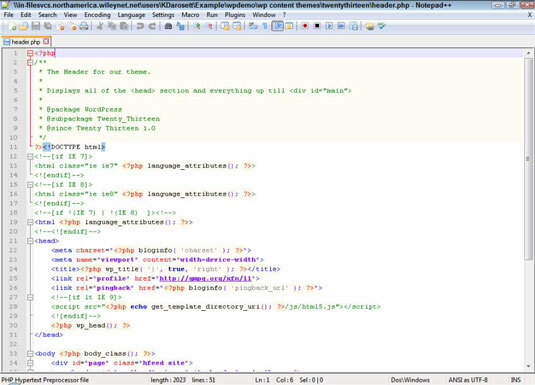 Notepad++ has advanced features such as color-coded syntax, code indentation, and line numbering, which make it an extremely useful and helpful application for writing and editing code. 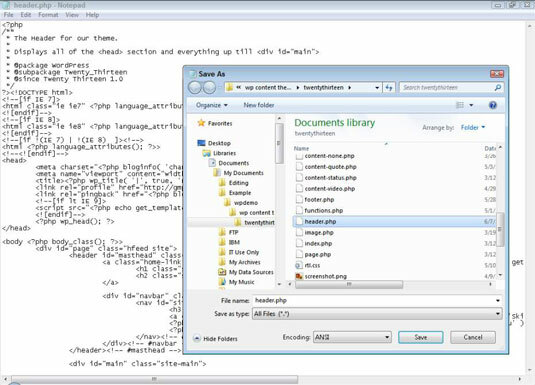 Notepad++ supports many programming languages: CSS, HTML, and PHP. Notepad++ is free open-source software! TextMate isn’t free, however. You can download a free 30-day trial. After the free trial ends, you can buy a single-user license for $56.